An artist’s impression of the belt of ‘pebbles’ in orbit around the star DG Tauri. The inset is a close up view of a section of the belt. Credit: J. Ilee. Adapted from original work by ESO/L. Calçada/M. Kornmesser, ALMA (ESO/NAOJ/NRAO)/L. Calçada (ESO). A team of astronomers led from St Andrews and Manchester universities today (6 July) announced the discovery of a ring of rocks circling a very young star. This is the first time these ‘pebbles’, thought to be a crucial link in building planets, have been detected. Dr Jane Greaves of the University of St Andrews presented the work at the National Astronomy Meeting at Venue Cymru in Llandudno, Wales. Planets are thought to form from the dust and gas that encircles young stars in a disk. Over time, dust particles stick together, until they build up bigger clumps. Eventually, these have enough mass that gravity becomes significant, and over millions of years the clumps crash together to make planets and moons. In our own Solar System, this process took place about 4500 million years ago, with the giant planet Jupiter the first to form. Since the 1990s, astronomers have found both disks of gas and dust, and nearly 2000 fully formed planets, but the intermediate stages of formation are harder to detect. 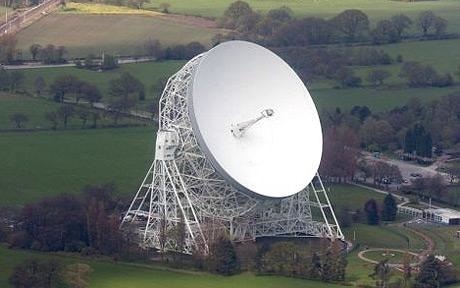 Dr Greaves and team colleague Dr Anita Richards from the University of Manchester used the e-MERLIN array of radio telescopes centred on Jodrell Bank, Cheshire, and that stretches across England in a so-called interferometer, mimicking the resolution of a single large telescope. Richards took charge of the image processing, which was initially meant just to test the handling of the very large data stream that e-MERLIN generates. The scientists used the interferometer to observe the star DG Tauri, a relatively youthful star just 2.5 million years old and 450 light years away in the constellation of Taurus. Looking at radio wavelengths, they discovered a faint glow characteristic of rocks in orbit around the newly formed star. Richards said: “This was the first time for this project that we folded in data from the 76m-diameter Lovell Telescope at Jodrell Bank, which is the heart of the e-MERLIN array. An e-MERLIN map of the star DG Tauri. The yellow and red areas show what is thought to be a ring of pebble-sized clumps in orbit around the star. Credit: J. Greaves / A. Richards / JCBA. The e-MERLIN observations were made at a wavelength of 4.6 cm (about a third of that used in microwave ovens). To give off these radio waves, rocky chunks at least a centimetre in size are needed, and the shape of the belt confirms the rocks as the source of the radio waves. Greaves leads an international team known as PEBBLeS – the Planet Earth Building Blocks Legacy e-MERLIN Survey. By imaging the rocky belts of many stars, the team will look for clues to how often planets form, and where, around stars that will evolve into future suns like our own. The ultimate aim is to zoom in and see ‘extrasolar Earths’ being born, five times closer in to their host stars than Jupiter’s orbit. 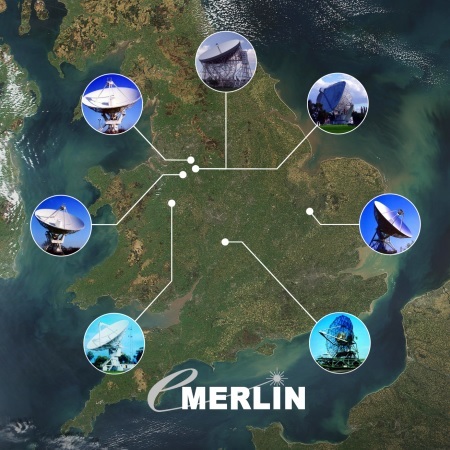 Upgrades to e-MERLIN’s capabilities in the next few years, as well as the construction of the new Square Kilometre Array (with its HQ at Jodrell Bank), make this a real possibility.